← Jackson “Bernanke-less” Hole Meeting …The LAST day of the summer? Interest rates are in total control lately as we have been mentioning frequently. Uncle Ben (Bernanke) looks set to begin taking the punch bowl away on September 22, 2013 their next scheduled meeting by backing down on the $85 billion monthly purchases. Of course, no one knows where rates will stop, but a move from the lows of 1.60% to almost 3% is an enormous move on a percentage basis and we are happily surprised how other asset classes have held up. How much farther can they go? Let’s start by using a hard/technical or text-book calculation. Generally rates should be the sum of economic growth (GDP) and Inflation (CPI). Using a smoothed trailing estimate of each of these, we feel comfortable with a 2%+2% or 4% total, under current economic conditions. For our easy calculation, let’s use a graph of the 10 year with the S&P 500 together, which is one of my personal favorites. With rates currently at 2.81%, if your eye gravitates to the same area as most, 4% looks like our target! So there you have it, 4% the technical way or the easy way from our perch. We are fine with this, but let’s just GO SLOW (12 months at least), if we move quickly to our target, there will be trouble! 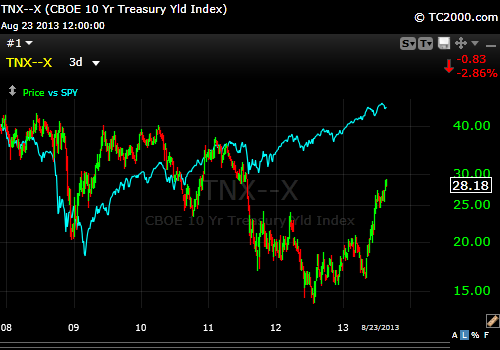 This entry was posted in Interest Rates, Investing/Financial Planning and tagged 10 Year, Interest Rate, S&P 500. Bookmark the permalink.